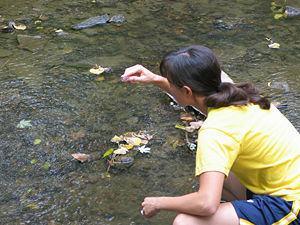 A researcher in environmental science takes samples of water. Environmental science is the study of interactions among the physical, chemical, and biological components of the environment. It provides an integrated, quantitative, and interdisciplinary approach to the study of environmental systems. It includes such diverse areas as geology, agronomy, meteorology, atmospheric chemistry, soil chemistry, water chemistry, systems modeling, and biological responses of systems to anthropogenic influences. Environmental scientists monitor the quality of the environment (air, water, and soil), interpret the impact of human activities on terrestrial and aquatic ecosystems, and develop strategies for restoring ecosystems. In addition, environmental scientists help planners develop and construct buildings, transportation corridors, and utilities in ways that protect water resources and reflect efficient and beneficial land use. Given the interdisciplinary nature of environmental science, teams of professionals commonly work together to conduct research or produce environmental impact statements, as required by governmental laws and regulations. In addition, various professional organizations engender work in environmental science and aid in interdisciplinary communications. The environment has been studied for at least as long as scientific investigations have been carried out. However, the recent interest in putting the pieces of understanding together to study environmental systems came alive as a substantive, active field of scientific investigation starting in the 1960s and 1970s. It has been driven by the need for a large, multi-disciplinary team to analyze complex environmental problems, the arrival of substantive environmental laws requiring specific protocols of investigation, and growing public awareness of a need for action in addressing environmental problems. Environmental science encompasses issues such as climate change, conservation, biodiversity, water quality, groundwater contamination, soil contamination, use of natural resources, waste management, sustainable development, disaster reduction, air pollution, and noise pollution. Because most environmental issues deal with human activities, they involve input from additional disciplines such as economics, law, and social sciences. Atmospheric sciences: Atmospheric sciences include meteorological studies, greenhouse gas phenomena, atmospheric dispersion modeling of airborne contaminants, sound propagation phenomena related to noise pollution, and even light pollution. For example, when studying climate change, physicists create computer models of atmospheric circulation and infrared radiation transmission, chemists examine the inventory of atmospheric chemicals and their reactions, biologists analyze the plant and animal contributions to carbon dioxide fluxes, and meteorologists and oceanographers add additional breadth in understanding atmospheric dynamics. Ecology: Ecology and environmental science are separate fields of study, but they overlap because of their multidisciplinary nature. Ecology is the study of the interrelations of living organisms, whether at the population, community, or ecosystem level, and of the relationships between organisms and their environment. Ecological studies could address endangered species, predator-prey interactions, habitat integrity, effects upon populations by environmental contaminants, or impact analysis of proposed land development upon species viability. An interdisciplinary analysis of an ecological system that is being impacted by one or more stressors might include several related environmental science fields. For example, one might examine an estuarine setting where a proposed industrial development could impact certain species by water pollution and air pollution. In this case, biologists would describe the flora and fauna, chemists would analyze the transport of water pollutants to the marsh, physicists would calculate air pollution emissions, and geologists would assist in understanding the marsh soils and bay muds. Environmental chemistry: It is the study of chemical alterations in the environment. Principal areas of study include soil contamination and water pollution. The topics of analysis involve chemical degradation in the environment, multi-phase transport of chemicals (for example, evaporation of a solvent-containing lake to yield solvent as an air pollutant), and chemical effects on biota. As an example study, consider the case of a solvent that has leaked from a tank and has entered the soil upgradient of the habitat of an endangered species of amphibian. Physicists would develop a computer model to understand the extent of soil contamination and subsurface transport of solvent, chemists would analyze the molecular bonding of the solvent to the specific soil type, and biologists would study the impacts on soil arthropods, plants, and ultimately pond-dwelling copepods that the endangered amphibian feeds on. Geosciences: They include environmental geology, environmental soil science, hydrology, physical geography, climatology, and geomorphology. They may also embrace oceanography and other related fields. As an example study of soils erosion, calculations would be made of surface runoff by soil scientists. In addition, hydrologists would assist in examining sediment transport in overland flow, physicists would assess changes in light transmission in the receiving waters, and biologists would analyze subsequent impacts to aquatic flora and fauna from increases in water turbidity. Environmental assessment: It is the process of appraisal through which environmental protection and sustainable development may be considered. Environmental assessments typically involve collection of field data, which can be from stakeholders and the ambient environment, and serve to harmonize the connections between the different branches of the environment and development. Environmental microbiology: It involves studying the composition and physiology of microbial communities in the environment. The environment in this case means the soil, water, air, and sediments covering the planet, and it may further include the animals and plants that inhabit these areas. Environmental microbiology also includes the study of microorganisms that exist in artificial environments such as bioreactors. Environmental biology: This sub-category of environmental science focuses specifically on the effects of environmental conditions on biological systems. Although it incorporates aspects of environmental science such as geochemistry and ecology, studies are focused on individual organisms, their biological processes, and their genetics. In addition, environmental biology incorporates the ideas of global change and conservation biology to encourage the conservation of biodiversity. In the United States, the National Environmental Policy Act (NEPA) of 1969 set forth requirements for analysis of major projects in terms of specific environmental criteria. Numerous state laws have echoed these mandates, applying the principles to local actions. This precipitated an explosion of documentation and study of environmental consequences before activities involving development. Some examples of Environmental Impact Statements prepared under NEPA are: Wastewater Treatment Expansion Options Discharging into the San Diego/Tiajuana Estuary, Expansion of the San Francisco International Airport, Development of the Houston, Metro Transportation System, Expansion of the Metropolitan Boston MBTA Transit System, and Construction of Interstate 66 Through Arlington, Virginia. In England and Wales, the Environment Agency (EA), formed in 1996, is the leading public body for protecting and improving the environment. The Agency was set up under the Environment Act 1995 as an independent body and works closely with UK Government to enforce the regulations. The magnitude and complexity of environmental problems are creating a growing need for scientists with rigorous, interdisciplinary training in environmental science. The majority of environmental scientists are employed in governmental positions, but the job market in the private sector is expected to see the most growth, especially in consulting firms, because of new rules and regulations. Growth in employment of environmental scientists will be spurred largely by the increasing demands placed on the environment and water resources by population growth. Further demand should result from the need to comply with complex environmental laws and regulations, particularly those regarding groundwater decontamination, clean air, and flood control. Employment of environmental scientists is expected to increase by 25 percent between 2006 and 2016, much faster than the average for all occupations. ↑ Iowa State University, Environmental Science. Retrieved April 29, 2017. ↑ Milton R. Beychok, Fundamentals of Stack Gas Dispersion (Irvine, CA: M.R. Beychok, 2005, ISBN 0964458802). ↑ Environmental Agency, Homepage. Retrieved April 29, 2017. Beychok, Milton R. Fundamentals of Stack Gas Dispersion. Irvine, CA: M.R. Beychok, 2005. ISBN 0964458802. Botkin, Daniel B., and Edward A. Keller. Environmental Science: Earth As a Living Planet, 6th edition. Hoboken, NJ: Wiley, 2007. ISBN 978-0470049907. Cunningham, William P., and Mary Ann Cunningham. Principles of Environmental Science: Inquiry and Applications, 4th edition. New York: McGraw-Hill Science/Engineering/Math, 2006. ISBN 978-0073304465. Enger, Eldon D., and Bradley Fraser Smith. Environmental Science: A Study of Interrelationships. Boston: McGraw-Hill, 2008. ISBN 978-0073304472. Wright, Richard T. Environmental Science: Toward a Sustainable Future, 10th edition. Upper Saddle River, NJ: Pearson, 2008. ISBN 978-0132302654. All links retrieved April 29, 2017. Cooperative Institute for Research in Environmental Sciences. This page was last modified on 29 April 2017, at 22:58.